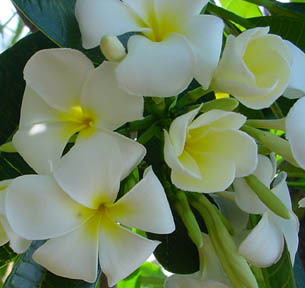 The Singapore white plumeria plant is among the most fragrant plumeria. The flowers of this plumeria average about 4" in diameter with large, white, rounded petals. The leaves of this plant are very rigid and glossy dark green. The singapore plumeria is identified by the rounded tips of the leaves. This plant is also an evergreen in the tropics and is frequently blooming while other plumeria are dormant. We send cuttings of this plant with size information as well as the "harvest" date, so you can be assured of the freshness of your cutting. The cuttings are covered under the Guaranteed to Grow policy. A printable version of plumeria care instructions are provided here.